After a multi-day delay, the final match of the WSOPE NLHE High Rollers Heads Up Championship (Event #4) is set to take place on Sunday evening (local time). Gus Hansen and Jim Collopy, who is also known as "Mr_BigQueso" online, are currently tied 1-1 in the finals of WSOPE #4 (10k NLHE Heads-Up Championship). Tournament organizers made the decision to postpone the deciding match due to the late hour early Friday morning, as match #2 (which was won by Collopy) concluded in the early hours of the morning. Both Hansen and Collopy wanted to participate in the WSOPE main event, which meant that the High Rollers Heads Up event had to be postponed until both players were knocked out of the main event. If either player had made a deep run in the main event, then there was a possibility that Event #4 may have concluded in November. 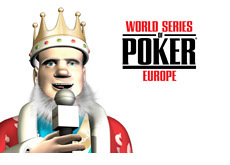 Instead, the final match of WSOPE #4 will get underway at 6 pm local time on Sunday evening. Both Hansen and Collopy are looking for their first World Series of Poker bracelets. Gus seemed to be on the brink of winning the title after easily breezing past Collopy in match #1 and securing a commanding chip lead in match #2, but, unfortunately for the "Great Dane", Collopy caught some cards and evened the match at 1. Hansen, who was visibly frustrated after losing Match #2 of the best-of-3 final, likely benefited the most from the multi-day pause in action. Will Hansen be able to overcome the disappointment of losing Match #2 after being so close to winning, or will "Mr_BigQueso" complete the come from behind victory to take down his first bracelet? We'll know in a few hours..